Kathleen Harnett White: Common Energy/Climate Sense | Watts Up With That? Sea-levels have been rising since the end of the last Ice Age 10,000 years ago. Whitehouse appears ignorant of the fact that the controversy is over the rate of sea-level rise. Sea-level rise is location specific because the findings are tied to local tectonic movements. Long-term studieswhere the underlying land mass is neither rising nor sinking show a rather consistent rate of raise of 7 to 12 inches per hundred years or less, and with no linkage to atmospheric CO2. The unbearable truth that renewable energy is “unreliable,” and “parasitic” was another criticism of her. The senators must know that with no wind there is no wind energy, and that absent sun gives no electricity. Generous production tax credits and tax write-offs are the financial sustaining energy provided by the Federal Government to fund these inefficient and unreliable energy sources. Taxpayers and captive ratepayers see their monies funneled by complicit politicians to favored corporate interests. What better illustration of parasitism than to see the work product of many sucked up by the unsustainable few? Originally posted at Master Resource, reposted here with permission. March 13, 2018 in Opinion. 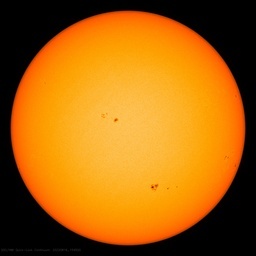 ← Do-It-Yourself: The solar variability effect on climate. A very sad day for the USA. Yes. Just like cities ship their garbage and convicts out into rural areas. Out of sight and out of mind. Rural areas, unite! Tell the cities to keep their trash, violence, law-breakers, sun-farms and pin-wheels to themselves! I’ve always wondered … what would be wrong with putting one of those giant windmills on top of all the buildings in Chicago …. I mean … Windy City! I read somewhere that the origin of the “Windy City” moniker, was a commentary on the cities politicians. With a huge sigh of relief, the greenies can now go back to cashing their subsidy checks. There is a typo–McCarthy was not head of the EPA in 2005, probably meant 2015. A lot of Trump’s appointees are being de-facto fillibustered. Funny, a few years ago I was assured that fillibustering on nominees was pure evil, since a president is entitled to have the people he wants working for him. Once again, leftists demonstrate that their morality is based on results only. just like conservatives and the budget deficit? Yea, but I don’t thing cracking counts as an alternative or renewable energy source. I find it truly amazing that governments continue to lend to projects that cannot get commercial lending and are then amazed that they will not pay back the finaning. Yes, private money sometimes doesn’t finance something that should be financed, but that loss is nowhere near the loss of financing lots of projects that should not be financed to try to get the one or two that private money misses. I try not to think of how rich and fabulous our lives would have been if governments had learnt from their mistakes over the last 100 years or so. The best thing for Trump to do is probably refuse to nominate anyone to the CEQ and instead simply allow it to become a defunct and pointless body. I don’t see it’s necessity. Virtually every alarmist case for CO2 destroying the planet has been shown to be wrong. How much longer will the world’s population tolerate the UN- elitists and their hangers-on, banging the drum on ‘global warming’ (aka the UN’s stipulated Anthropogenic Climate Change™) when no such disorders are evident. A half a degree Celsius of planet-wide warming in a century is well within normal NATURAL bounds of temperature change since coming out of the LIA. Sub synchronous resonance issues due to interaction of the electric network and the complex shaft/gear system of the wind turbine. Whitehouse is just plain ignorant of many things. Mostly things that are true. As an atmospheric gas, [CO2] is a plant nutrient. It’s more than that, it is an essential ingredient. We are a carbon based life-form. Every carbon atom in your body was once CO2 in the atmosphere. Could have been CO2 in the water. Better yet, move all the bureaucrats to other jobs, sell off the office furniture and supplies, sell off the building space and in general make it hard for the next liberal president to justify keeping the agency going. Can’t we save them for later? Just read the propaganda slam about Ms. White at Wikipedia – https://en.wikipedia.org/wiki/Kathleen_Hartnett_White. Very pathetic! If you follow the problems path for “donate to wiki”, you eventually get to an e-mail link … you can e-mail them about the specific problem you have with donating to them. I did. The average 20th century rate of SLR has been 2.5 m/millennia. This graph is 24 millennia wide. A line with a slope of 2.5 m/millennia rises 60 m going from 24 to 0 millennia ago. Draw the line by eye. Sea level clearly has not been rising since the last ice age at anything like the rate it rose during the 20th century. It slowed, probably stopped and was rising rapidly when tide gauges appeared. Some people believe that sea level reached a maximum during the Holocene Climate Optimum and feel a few meters over the last few millennia. The above graph was assembled from data obtained from old coral reefs. It can only accurately characterize SLR at a rate as low as 1 m/millennium when maintained over several millennia. It is adequate for demonstrating that the average rate of SLR observed in the 20th century (or 1/2 or 1/4 that rate) did not extend back to the end of the last ice age. 20th-century SLR is distinctly ABNORMAL compared with the average of the last 4 millennia. Yet your chart seems to contradict your statement? To me, your chart clearly shows: “Sea-levels have been rising since the end of the last Ice Age 10,000 years ago”, no? Paul wrote: “Sea-levels have been rising since the end of the last Ice Age 10,000 years ago”, no? Absolutely not. For all practical purposes, SLR due to the end of the last ice age ended about 7 millennia ago. The rise has been negligible (compared with SLR in the 20th century) for the last 4 millennia. The tide gauge record of SLR is ABNORMALLY high over those millennia and probably began with the end of the LIA, not the last ice age. What you wish to believe and what is actually so do not overlap. The link to the map of the retreat of ice sheets didn’t work when I clicked on it, but does when I copy and past it into my browser. Sorry. We know that sea levels have been rising since the end of the Little Ice Age, so your claim that there has been no SLR had all but stopped a millennia ago is utter nonsense. Nonsense! Print the graph of SLR. Draw a line of slope 2.5 m/millennium from (-60 m, 24 millennia ago) to (0,0). Compare the slope of that line with the slope over the last 4 millennia. For all practical purposes, significant SLR had ended during these 4 millennia. It is crazy to suggest that: 1) SLR was 10 m/millennia for roughly 10 millennia due to the end of the last ice age, 2) then fell less than 1 m/millennium over the last 4 millennia, and 3) surged back to 2.5 m/millennia when tide gauges appeared – because of an ice age that ended about 10 millennia ago. Melting at the end of an ice age can gradually slow, but it won’t accelerate long many millennia after the ice has stopped retreating. The current surge is being caused by the end of the LIA and GHG mediated warming in the second half of the 20th century. So one chart chart of low resolution refutes actual data on the ground. MarkW and Paul: Check out this map of the retreat of the Laurentide Ice Sheet in North America (the biggest one). It show that the bulk of ice on land had retreated to present day locations by six millennia ago. That is why SLR stopped around this time – the big ice sheets were gone and the remaining ones in Greenland and Antarctica had reached equilibrium positions. In the Arctic, the warmest temperature occurred during the Holocene Climate Optimum 6 to 8 millennia ago. The current rate of SLR is very high (ABNORMAL) compared with the average over the past 5 millennia. Tide gauges: 9 inches over 13 decades = 0.7 inch/decade = 1.8 cm/decade = 0.18 m/century = 1.8 m/millennia. Ignoring the issue of whether there has been a real change in rate (acceleration), let’s call this roughly 2 m/millennia (1 inch/decade). 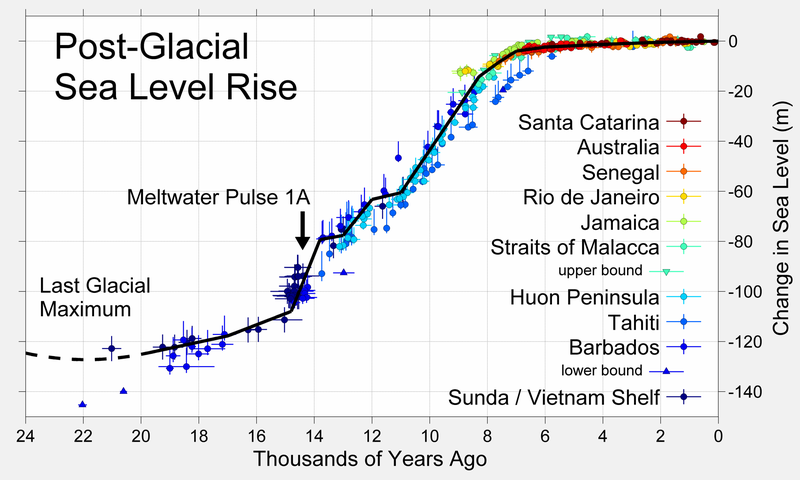 Extrapolating back, over the last 5 millennia, that would be 10 m of sea level rise. The graph makes it very clear there hasn’t been anything close to 10 m of SLR in the past 5 millennia. The experts are arguing over whether there has been 1 or 2 meters of sea level rise OR FALL during this period. Changes this slow are hard to measure. 1 m /5 millennium = 39 inches/500 decades = 0.08 inch/decade. 1 inch over the 13 decades of tide gauge measurements! ESSENTIALLY UNDETECTABLE with today’s tide gauges or satellites. For all practical purposes, the average rate over the past 5 millennia is ZERO. ZERO. SLR was 10 m/millennia as the ice sheets melted. It dropped to ZERO (too small to be detected with today’s technology) for about 5 millennia. It is now 2 m/millennia (1 inch/decade). We know glaciers in the Alps advanced and retreated during the warm and cold periods like the LIA, MWP, and RWP. These periods only lasted only for a few centuries – too short of coral records to have detected any change. Coral only detects such changes when they last for millennia. We know for sure that todays’ rate of SLR didn’t persist for the last 5 millennia, but today’s rate of change could persisted for a few centuries during past warm periods without showing up in the coral record. When tide gauges appearred, we were in a warm period, so SLR was rising. We are still in a warm period. If the current rate of rise continued for a 1000 years, scientists LOOKING ONLY AT CORAL will be reporting the first detection of SLR perhaps 500 years from now. Is that like all the other “we knows” in science over the last 100 years or so? We know the atom is indivisible, we know the Earth’s crust is solid and immovable, we know ulcers are caused by stress and we know that what happened to people in the famine in Holland in 1944/45 cannot possibly influence the weight of their grandchildren. As a pseudo-wise man said, what you wish to believe and what is actually do not overlap. He was a pseud, because he didn’t udnerstand his own saying – what is, is not actually known, so believing you know what is, falls under the first part of the statement anyway. Phoenix44 asked: Is that like all the other “we knows” in science over the last 100 years or so? The coral record of SLR rise over the past 5 millennia has probably been compiled from roughly half a dozen sites with C14 dating and using GPS to establish relative elevation and possibly stability to vertical land motion. The borders of tectonic plates and the stability of the center of such plates has been known for many decades. Will studies at another half dozen sites change this picture? Not likely. We also have carbon dating to tell us when ice first disappeared and trees started growing. The date the last significant fraction of the Laurentide Sheet disappeared from most of North American isn’t likely to become one or two millennia ago, rather than 6 millennia. However, there is no absolute certainty. Nevertheless, it is ignorant to suggest that the rate of SLR when tide gauges first appeared is a “normal rate” of SLR for a late-interglacial period. The water to maintain such a rate needs to come from somewhere! Greenland contains enough water to raise SLR about 7 meters. To maintain the current rate of SLR, we need to melt a Greenland’s worth of ice every 3.5 millennia. It is far more sensible to believe recent warming (the end of the LIA and any GHG-mediated warming) is causing current SLR than warming 10 millennia ago. Your explanation is detailed: the recent rise is higher than the long term average over the last 4 millennia. So what? That is trivially true but is not a valid comparison. It is the same error made when M Mann (MBH98) compared a short term instrument temperature rise to a highly smoothed long term average. If you want to sell your point, you have to show that there were no similar seal level rises of the same length during that 4000 year period. Obviously that will be difficult to show because of a lack of data. A lack of data does not support the veracity of inappropriate comparisons, it remains a lack of data. We know that sea level was a couple of metres higher in the recent past, during that 4000 years, but we do not know how rapidly it went up or down. Our ancestors were too busy slaughtering and enslaving each other to worry about a few mm of sea level. According to current thought, the Ice Age (Quaternary glaciation) hasn’t ended. The most recent Last Glacial Maximum ( LGM link ) began its ending about 20,000 years ago. At that time, ice began to melt rapidly, but not equally every where. Sea level began to rise rapidly, but not equally every where. About 7,000 years ago much of the ‘easy to melt ice’ had melted. Melting and sea level rise both slowed and remain that way. Earth is in an interglacial period, at the present time. It is now more common for researchers to refer to the periods by their marine isotopic stage number. I found evidence years ago of a c.1.5-2m fall since the Holocene Optimum c.6000ya. This has since been vindicated worldwide. Some small drop over the LIA too……Brett in NZ. The shoreline of the Gulf of Mexico was 50 miles inland from present day, 4000 years ago from archeological digs of indigenous peoples’ sites. The SL was 6′ higher then. Why bother having a scientist on the committee if the politicians already know everything? Kip: “The unbearable truth…” paragraph appears twice. Typo, or for emphasis? Nice article. The Democrats didn’t like Kathleen Hartnett-White’s truthful comments about CO2 and climate change but Iowa Republicans Grassley and Ernst didn’t like her truthful comments regarding ethanol and the flawed public policy surrounding this Bush 43 initiative to reduce our nation’s dependence on foreign oil. Ethanol mandates and credit exchanges with speculators in the market driving up refining costs for everyone are just a Republican version of crony capitalism that makes absolutely no engineering nor economic sense for the vast majority of Americans. I suspect Republican opposition to Kathleen’s nomination was more critical than the Democrat opposition. The swamp in Washington is broad and much deeper than most swamps I’ve visited.